I had somewhat relaxed holidays. Didn’t go any where. I just stayed in New York. Armando and Humberto’s mom drove up from Brownsville and stayed with us. We saw a lot of Bill and Adelina as well, which is always cool. On Christmas Eve, we went to Adelina’s apartment in the Nolita area. Adelina made a rib roast, sides and pumpkin cheese cake (if I remember correctly). I brought some wine, and we had a great time. Unfortunately, Bill was in Richmond and wasn’t there for Christmas. He did make it back for New Year’s, which was also a blast. Christmas Day I went over to Brooklyn and hung out with Risa. She had some Lambic beer. Most beer, lager and ale, is made from pre-chosen yeasts, but lambic “wild” yeast is made like they way they make sourdough starters. More info on the Wikipedia link. I was totally digging the lambic, although it did strike me as a little “girlie”. I’ll have to research further. We moved on to some Riesling that I brought and had some spaghetti, sausage and peppers. We watched Best in Show and Drop Dead Gorgeous. Both were a lot funnier than I remembered. Another good day. New Year’s was better than I expected, not that I wasn’t expecting to have a good time. 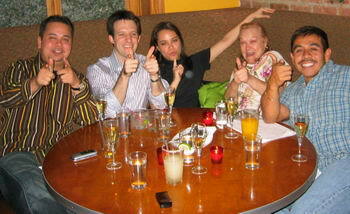 Humby’s family and I went to the Hell’s Kitchen restaurant. We were talking about this place with Humby’s mom for 2 weeks and we got reservations for 10pm. Bill and Adelina brought a bottle of Piper-Heidsieck Brut NV, and the corkage ended up being only half of what we expected. The food was somehow better than I remembered it, the champagne was better than I was expecting from a Piper-Heidsieck. I was reading an article on champagnes, and the section on Piper-Heidsieck was right next to the Bollinger section. It said that Bollinger is the James Bond champagne of choice. We were talking about James Bond accessories, and I confused Bollinger with Piper-Heidsieck and was convinced we were drinking 007 champagne! I can’t remember which order this happened, but now I’m wondering if the champagne being better than expected made me think it was the Bond brand, or if thinking it was the Bond brand made the champagne seem better than it was! A lot of it is mental I guess. In any case, it was all great. Midnight came around and we had a good toast and eventually made it out. We walked slowly home and marveled at all the people that were out. As we passed Snug, Rob saw me and said that he could totally sneak me in. I eventually came back and finished the night at Snug. All the regulars and staff were there. I didn’t buy a VIP ticket because I don’t really have friends there other than the staff, but I still had a great time. Again, better than expected! I ended up staying out until 4 that night. Great time!